The Teutoburg Forest (German: Teutoburger Wald, German pronunciation (help·info), colloquially: Teuto) is a range of low, forested hills in the German states of Lower Saxony and North Rhine-Westphalia. In 9 CE, this region was the site of a major Roman defeat, the Battle of the Teutoburg Forest. Until the 19th century the official name of the hill ridge was Osning. The Teutoburg Forest is a peripheral section in the north of the German Central Uplands, and forms a long narrow range of hills (comprising three ridges) extending from the eastern surroundings of Paderborn in the south to the western surroundings of Osnabrück in the northwest. South of the city centre of Bielefeld, a gap called the Bielefeld Pass bisects the range into the Northern Teutoburg Forest (two thirds) and Southern Teutoburg Forest (one third). In addition, the northeastern and southwestern ridges are cut by the exits of the longitudinal valleys between the ridges. The geologically oldest ridge is the northeastern one, which consists of limestone of the Triassic. Most of the ridges and part of the valley are covered by deciduous forest. Parts of the valley areas are used for agriculture, especially production of cereals. 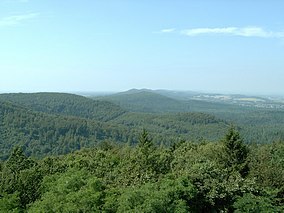 The highest elevation in the Southern Teutoburg Forest is the Velmerstot (468 m) (south of Horn-Bad Meinberg). In the Northern Teutoburg Forest the highest elevation is the Dörenberg (331 m) (north of Bad Iburg). 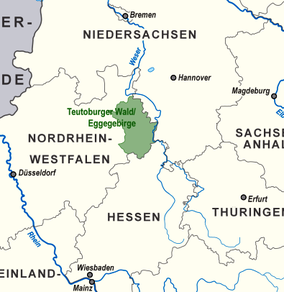 The river Ems has its source at the western base of the southernmost portion of the Teutoburg Forest. The southern half of the range, situated about 30 km southwest of the Weser valley, is part of the watershed between the Ems basin in the west and the Weser basin in the east. The drainage towards the Weser is effected by the Werre river. The northwestern half of the range is drained to the river Ems on both sides. The neighbouring landscapes are the Westphalian Lowland in the west, Hase valley in the north, the hilly Ravensberg Basin in the northeast, Lippe Uplands in the east, and Egge Range (Eggegebirge) in the south. Except for a short area south of Osnabrück, which belongs to the Bundesland of Lower Saxony, the whole forest is part of North Rhine-Westphalia. The Battle of Teutoburg Forest in 9 A.D. occurred in or near this region, though the exact location is disputed. The Roman historian Gaius Cornelius Tacitus identified the location of the battle as saltus Teutoburgiensis (saltus meaning a forest valley in Latin). Recent excavations suggest that at least the final stages of the battle took place further northwest, at Kalkriese, north of Osnabrück. Arminius (a.k.a. Hermann the Cherusker), leader of the Germanic tribes during the battle, became something of a legend for his overwhelming victory over the Romans. During the period of national renaissance in the wake of the Napoleonic wars, German people saw him as an early protagonist of German resistance to foreign rule and a symbol of national unity. A monumental statue of Arminius commemorating the battle, known as the Hermannsdenkmal (the "Hermann monument"), was erected on the hill of Grotenburg near Detmold, close to the site where the most popular theory of the time placed the battle. Emperor William I, the first Kaiser of the unified German Empire, dedicated the monument in 1875. A monumental statue of the emperor himself was erected on the hill of Wittekindsberg in Wiehen Hills. In order to create a national landscape the Osning Hills were given the name "Teutoburg Forest", see also Teutonic. However, the old name survived among the local population and the part of the ridge around the Ebberg (309 m) near Bielefeld is still known as the Osning today. The composer Johannes Brahms liked to take walks in this forest during his stay in Detmold. ^ Paul K. Davis, 100 Decisive Battles from Ancient Times to the Present: The World's Major Battles and How They Shaped History (Oxford: Oxford University Press, 1999), 68. ^ Fergus M. Bordewich (September 2006). "The Ambush That Changed History". Smithsonian magazine.